Hibernian manager Neil Lennon hailed his side's 3-0 win over Dundee United as "the best in my time here" after dominating their closest title rivals. Jason Cummings' brace and a goal from the returning John McGinn saw them open a four-point lead in the Championship. 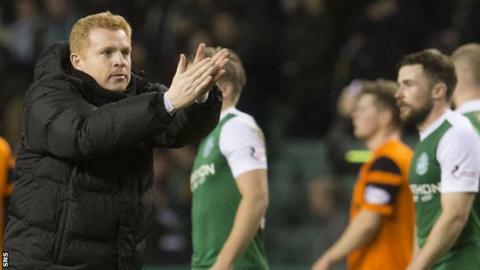 "Under the circumstances, against a very good side, we were superb from start to finish," said Lennon. "We attacked with great verve, we counter-attacked brilliantly and looked a threat all evening." A crowd of 18,786 - the biggest in the second tier this season - saw the hosts turn in a strong performance, with United fortunate not to lose by a greater margin. "This is a tough league and we are not taking anything for granted. But this gives us a bit of a cushion now." The manager's decision to give new winger Chris Humphrey, who had not played since October, a debut after his arrival from Preston last weekend paid instant dividends. The former Motherwell player laid on both of Cummings' goals, while Martin Boyle also impressed on the left flank for Hibs. "I thought the two wingers were outstanding," Lennon told BBC Scotland. "For Chris to come in having not played for a while, we thought it was a gamble worth taking. We have looked a bit pedestrian in the last few games. "I have always liked Chris, and the recruitment team did a great job getting him here. His attitude has been fantastic and from day one he has looked the part. It was a great debut. "I loved that second goal. We don't get enough tap-ins. We wondered whether Cummings should start up front on his own but he was awesome tonight. "I have got a good player in Martin Boyle too. He just needs to believe in himself a bit more at times but I like what he has and he was a threat. "We agonised over the team selection and formation all afternoon, but thankfully it paid off." Lennon was also able to give fit-again McGinn a late run-out after two months out following an ankle operation, and he put the seal on a thumping win with a superb late goal. "We have missed John," he said. "We weren't sure if we could give him 15 minutes but the medical team said he was OK. We just wanted him in there to shore things up, but he did more than that. He is a class player." Lennon also confirmed he will speak to Kris Commons over the coming days about extending his emergency loan from Celtic, which ends on 10 January, until the end of the season. "I love him as a player. He is still rusty and had a cold tonight but he has an aura about him." Dundee United had briefly moved above Hibs a fortnight ago on the back of 14 matches unbeaten, but a second successive loss leaves them four points adrift in the promotion battle. "I am really disappointed," manager Ray McKinnon told BBC Radio Scotland. "That wasn't great from us and we conceded the game in the first 20 minutes. "It was really nervy at the start and they were really ragged. We didn't deserve to get anything. We didn't pass it with any zip or purpose. "We are four points off the top the league and we will be giving it our best in every game to the end of the season to get promotion. "At the start of the season, we would have been pleased to be in this position with a chance to win the league."